Levitt, Leichenger & Aberle LLP of Beverly Hills, CA obtained a $7,775,000 settlement for their client who was injured when a steel shackle was dropped from overhead while the Plaintiff was working for a contractor to a major Southern California utility company. A loss of consortium claim by Plaintiff’s wife was included as part of the comprehensive settlement. In addition to the third party settlement, Plaintiff’s counsel negotiated a complete waiver of the workers’ compensation lien, further increasing their client’s net recovery by over $500,000. 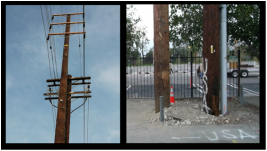 The Plaintiff, a 46 year old man, was a laborer working at a field location controlled by the utility, filling in dirt around a newly set 60’ foot electrical pole. Defendant failed to clear the area below before a pole climber ascended the pole. While plaintiff worked at the bottom of the pole as he was directed, Defendant’s employee, while 30 feet up on the pole negligently dropped a 13 pound steel shackle which fell, landing on the back of Plaintiff’s head at the brain stem. Thankfully, Plaintiff was wearing appropriate safety gear and the injury was not fatal and did not result in paralysis. However, Plaintiff suffered a mild traumatic brain injury and a spinal cord injury, among other injuries. Plaintiff was and continues to be unable to return to gainful employment. For Mr. Doug Aberle of Levitt, Leichenger & Aberle, MotionLit produced a Settlement Documentary with the use of their broadcast quality video production and engaging storytelling capabilities conveying a profound message in a short narrated video presentation. Used as part of Mr. Doug Aberle’s demand package, the video captured the theories of liability, and total loss and damages that the Plaintiff sustained. Filming of the Plaintiffs Day-in-the-Life video not only established the injuries, physical limitations and hardships, but also captured the impact on surrounding family members and friends. The on-screen interviews painted a picture of a man that was once a capable father, intimate husband and a hard working man that now requires full time 24 hour care. The Settlement video that MotionLit effectively and efficiently produced played an integral part on the final decision making process for the opposing counsel and insurance adjusters in helping understand and analyze the full scope of the story in a short period of time. Apart from maximizing the value and scope of the case, the Settlement video prepared by MotionLit allowed the opposing parties to see a preview of the real people who are hurt, that would’ve ultimately been testifying on the stand in front of a jury, had the defendant not settled. Congratulations to Doug Aberle and the Levitt, Leichenger & Aberle firm for their continued fight to help bring justice to consumers!